Ismism is the fourth album by English band Godley & Creme. 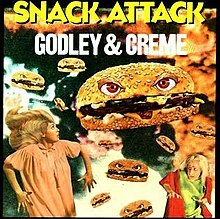 The album was released in the US under the name Snack Attack. The album cover originally was in white with the title spelt out via holes in the cover which showed a contrasting colour beneath. Later versions used coloured dots instead of holes. An alternative version of the cover featured a black background. It contained two UK top 10 singles, "Wedding Bells" and "Under Your Thumb". All songs composed by Kevin Godley and Lol Creme. "Five O'Clock in the Morning"
"Save a Mountain for Me"
"H.E.A.V.E.N./A Little Piece of Heaven"
This page was last edited on 22 October 2018, at 18:04 (UTC).